Un peuple dans les rues le 7 février. Publié le 02-08-2019 | Le Nouvelliste. Yon gwo chapit nan istwa Ayiti (20èm, 21èm syèk)… Tranntwa ane depi diktati Duvalier a (papa, pitit) tonbe, èske Ayiti avanse oubyen l rekile plis? Pa gen dout se kesyon anpil Ayisyen ta poze jodiya. Pèp la t ap selebre 33 ane de sa; li t ap chante «Ayiti libere 7 fevriye 1986». They were living under a cruel dictatorship for 28 years (1957 – 1986), where they couldn’t express themselves. They were really happy on February 7, 1986 when they could start breathing a fresh air, when they could express themselves without panicking. But what progress has Haiti made after these three decencies, when hearing the cry of the people (before 2018, and up to today)? Li t ap viv anba yon diktati fewòs pandan 28 an (1957 – 1986), kote l pa t ka esprime l. Li te reyèlman kontan 7 fevriye 1986 lè l te ka kòmanse respire yon lòt lè, lè l te ka esprime l san kè kase. Men ki pwogrè Ayiti fè apre 3 deseni sa yo, lè n ap tande kri pèp la (depi avan 2018, e rive jounen jodiya)? We don’t really see (radical) changes occurred, besides some nice articles written in the 1987 Constitution. But here again, it’s a Constitution that needs to be revised, and amended (to unblock Haitians in Diaspora* so that they can participate fully in the country’s politics). But they (lawmakers) don’t block many millions of green dollars that this Diaspora has been sending (via money transfer, and that is considered to be the economic backbone of Haiti (keeping her still alive on life support, in the coma she has been). Nou pa reyèlman wè chanjman (radikal) ki fèt, apa kèk bèl atik ki ekri nan Konstitisyon 1987 la. Men la a ankò, se yon konstitisyon ki bezwen revize, e amande (pou debloke Ayisyen dyaspora* dekwa pou yo ka patisipe nòmalman nan politik peyi a). Men (palmantè) yo pa bloke plizyè milyon dola vèt dyaspora sa a ap voye (atravè transfè) lajan, e ki konsidere kòm kolòn vètebral ekonomi Ayiti (ki kenbe l vivan toujou, nan koma li ye). Yes, we hear the people’s cry many times, where they are tired of the situation in which Haiti has been a long time (insecurity, high cost, poverty, many youngsters who are living for Brazil, Chile*, those who continue risking their lives in flimsy boats to reach the Bahamas, Miami… and all that we can add up as negative that the Haitian people have been experiencing). Wi nou tande kri pèp ayisyen a plizyè repriz, kote yo fatige ak sitiyasyon Ayiti ap viv depi lontan (ensekirite, lavichè, povrete, anpil jèn k ap kite al Brezil, Chili*, sa ki kontinye ap riske vi yo nan pran kanntè pou ateri Bahamas, Miyami… e tout sa nou kapab mete de negatif ke pèp la ap viv). This same reality inspired us to publish (the first edition) of a historical and post-dechoukay* novel (in 1994), entitled Sezon Sechrès Ayiti*. More or less this work of fiction summarizes many of these problems the Haitian people have been living. That wasn’t enough, in one of our reflections in 2000, we published 16 Points to help Haiti moving forward. Sezon Sechrès Ayiti*. Plizoumwen liv sa a rezime anpil nan pwoblèm sa yo pèp Ayisyen ap viv depi lontan. Sa pa t sifi; nan youn nan refleksyon nou an 2000, nou pibliye 16 Pwen pou ede Ayiti bouje. Recently, we were hearing some voice mails of people crying. They can no longer take it; they can’t eat; they don’t have works ... We heard the voice of some professionals, what they are doing for instance to survive, humiliating jobs where when things were good (for them), even their maids would not do what they are currently doing. Resamman, nou t ap tande yon seri vokal kote pèp la ap kriye. Li pa kapab ankò; li pa ka manje; li pa gen travay... N ap tande vokal yon seri pwofesyonèl, sa y ap fè pa egzanp pou siviv, travay imilyan y ap fè kote lè bagay la te bon pou yo, menm bòn lakay yo pa t ap fè sa y ap fè aktyèlman. But we should consider everyone as human... Due to certain access people don’t have, they are obliged to do certain things. We are asking the political actors what they have in their head. We want to refer to those who participated in elections, who get elected, and who ascended to power. Men nou dwe gade tout moun kòm moun... Akoz aksè sèten moun pa genyen, yo oblije fè yon seri bagay. N ap mande aktè politik yo kisa yo gen nan tèt yo. Nou vle refere a sa yo ki te ale nan eleksyon, ki eli, epi ki monte sou pouvwa. It’s true that the people have the right to protest, to claim their rights... All these thieves should have been arrested, and we are still finding some of them in high positions. So when the people are asking for justice, we can ask: can thieves judge thieves? It’s the question the people may ask in a sense. In term of justice, we don’t believe they would find it knowing the truth (who is really serious [clean] to give justice?). 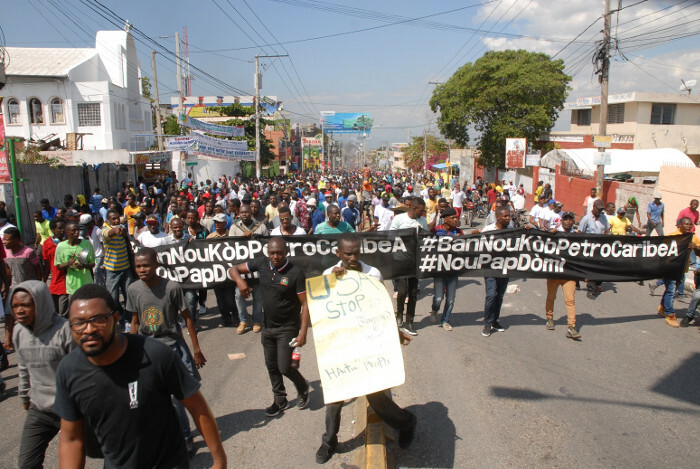 Se vre, pèp la gen dwa manifeste pou reklame dwa l... Tout vòlè sa yo ta dwe anba kòd, e n ap jwenn ladan yo ki nan gran pozisyon toujou. Donk lè pèp la ap reklame jistis, n ap di: èske vòlè ka jije vòlè? Se kesyon nou ka poze nan yon sans. An tèm jistis, nou pa kwè l ap jwenn sa lè nou konn verite sou tanbou (kilès ki vrèman serye ki pral ba l jistis?). We hear many of the people’s cries. Many cry for food they can’t find; they don’t have money either to buy it because they are not working. But the big question one can ask is: what does Haiti produce, in terms of agriculture? For example, since many years, governments come and go, but Haiti remains the same (we don’t see change)… We see during electoral campaigns, agriculture is not a subject they would talk about (in terms of revolution that's needed to take within it in order to have enough food, to encourage national production, to lower the price of food, and to put Haiti at a high economic level to help with its development). Nou tande anpil nan kri pèp la. Anpil kriye pou manje yo pa ka jwenn, yo pa gen lajan pou achte nonplis pase yo p ap travay. Men gwo kesyon nou ka poze, se: kisa Ayiti pwodui, an tèm agrikilti? Pa egzanp, depi plizyè ane, gouvènman monte /gouvènman desann, men Ayiti rete an plas (nou pa wè chanjman)… Nou wè pandan kanpay elektoral yo, agrikilti pa yon sijè yo pale de li (an tèm revolisyon ki ta dwe fèt ladan, pou ta gen ase manje) pou ta met Ayiti nan yon nivo ekonomik elve pou ede nan devlopman l.
Once these roads are built, the capital would be decongested (with many people piling up in it). National and international tourists would circulate with no problem, and that would help a lot in the country’s economy. Communication and transportation would work rapidly. That would help a lot in the development of the communes’ infrastructures for their local economic development and touristic attractions some of them have, and which need to be developed. Yon fwa wout sa yo ta fèt, kapital la ta dekonsantre (ak pakèt moun ki anpile ladan). Touris nasyonal e entènasyonal ta sikile san pwoblèm, e sa ta ede anpil nan ekonomi peyi a. Kominikasyon e transpòtasyon ta fèt rapidman. Sa t a ede anpil nan devlopman enfrastrikti komin yo pou devlopman ekonomi lokal ak atraksyon touristik kèk ladan yo genyen, ki bezwen devlope. For example, we are looking at what happened during the January 2010 earthquake. Many people who were there (in the capital), it’s possible that they just stopped by in Port-au-Prince; they would come to take care of something, came to make a passport, and identity card... something somehow, and they got cut in the earthquake. If the department and communes where they are from were developed, many of them would not be victims. Pa egzanp, n ap gade sa k te pase nan tranblemanntè janvye 2010 la. Anpil moun ki te la (nan kapital la), yo kapab te de pasaj nan Pòtoprens; yo ta vin regle yon bagay, vin fè yon paspò, yon katdidantite... yon bagay kèlkonk, epi tranblemanntè a bare yo. Si depatman e komin kote yo soti a te devlope, anpil ladan yo pa ta viktim. So, we Haitians, as individuals (with no political power), what can we do (in our potential)? There are some important times when we should stand up, when we should raise our voice (in terms of education we can do and should do to open others’ eyes). The solution is not in breaking and smashing shop windows, it’s not in burning tires, and it’s not in setting people’s business on fire... It’s not in violence. Donk, nou menm Ayisyen, etan endividi (ki pa gen pouvwa politik), kisa nou ka fè (nan potansyèl nou)? Gen kèk epòk enpòtan, kote n dwe leve kanpe, kote n dwe leve vwa nou (an tèm travay eklerasyon nou ka fè e dwe fè pou ouvri zye lòt). Solisyon an pa nan kraze-brize vit magazen, li pa nan boule kawotchou, li pa nan lage dife nan biznis moun... Li pa nan vyolans. But rather knowing the reality the country has been experiencing, the importance for Haitians to solidify, and how it’s important in difficult moments to look at what solution to bring. It’s very important also during election times to reflect well on who we are going to vote for (what’s the candidate’s dossier? what has that candidate done already as positive work in the society? does this candidate has moral?). Men pito se konnen reyalite peyi a ap viv, enpòtans pou Ayisyen solidarize, e kòman li enpòtan nan moman difisil pou n gade ki solisyon nou ka pote. Li trè enpòtan tou lè epòk eleksyon pou n reflechi byen kilès nou pral vote (ki dosye kandida sa a? ki travay pozitif kandida a fè deja nan sosyete a? èske se yon kandida ki gen moral?). There are people they pay to vote. There are those they give some booze to vote. There are those who vote for a dish of food… So it’s about time for Haitians to learn to vote with consciousness (not for personal interest, but rather for a country’s interest, not on emotion but after reflection). Gen moun yo peye pou vote. Genyen yo bay yon kout kleren pou vote. Genyen ki vote pou yon plat manje… Donk li lè li tan pou Ayisyen aprann vote ak konsyans (pa pou enterè pèsonèl men pito pou enterè yon peyi, pa sou emosyon men pito apre refleksyon). President Obama made an important comment, where he said that the leader we choose to lead us reflects the character of a nation. It’s an important comment upon which Haitians should reflect, in terms of their choice of leaders they are making to lead them (when looking at people for instance who are voting some candidates who are thieves, who have gangs, who are gang members, who meddle in all kind of business, and who have no moral) this reflects the people’s level who are voting. Prezidan Obama fè yon kòmantè enpòtan, kote l di ke lidè nou chwazi pou dirije n, sa reflete karaktè yon nasyon. Se yon kòmantè ki enpòtan pou Ayisyen reflechi sou li, an tèm chwa lidè y ap fè pou dirije yo (lè n ap gade pa egzanp pèp k ap vote yon seri kandida vòlè, ki gen gang, ki nan gang, ki nan tout sòs, e ki san moral) sa reflete nivo moun k ap vote yo. In conclusion, think about where Haiti is today, what you can do in your capacity or in group to help. Don’t just remain seated when there is possibility to do something from which others can benefit, and an entire country. Each of us can be a leader (in our field), as long as we cut in front to start the work we see that should be done. That way, each person should ask their self this questions: what have I done as positive already to help Haiti, my native commune or my community? Better late than never. Think about it also as a civic and patriotic duty (as individual who understands Haiti’s situation), and how you can be part of a team for change. An konklizyon, panse a kote Ayiti ye jodiya, sa ou ka fè nan kapasite w oubyen an gwoup pou ede. Pa jis ret chita lè gen posiblite pou fè yon bagay ki ka benefisye lòt moun, e tout peyi a. Chak nan nou ka yon lidè (nan domèn pa nou), osilontan nou pran devan pou tanmen travay nou wè ki dwe fèt. Konsa, chak endividi dwe poze tèt yo sa a: kisa m fè ki pozitif deja pou ede Ayiti, komin mwen soti a, oubyen kominote kote m ap viv ladan an? Li pa janm two ta pou fè sa k bon. Panse a sa tou kòm yon devwa sivik, e patriyotik (kòm endividi ki konprann sitiyasyon Ayiti), e kijan ou ka fè pa fè pati de yon konbit pou chanjman. We thank playwright Jan Mapou who played the (draft) of the voice mail on NPR (National Public Radio) 91.3 fm, Miami. February 8, 2019. Thanks to all countrymen who circulate it on the social networks, as part of our (reflection) section “Educating Haitians in Haiti, and Haitians in Diaspora.”… We also want to thank Claudel Pierre-Louis, who, sometimes helps us finding some images in Haiti to illustrate our texts. Thanks to Jean Heber Bellefleur who helps circulating online many of our reflections. Nou remèsye dramatij Jan Mapou ki te pase (bouyon) vokal tèks sa a nan radyo NPR (National Public Radio) 91.3 fm, Miami, 8 fevriye 2019. Mèsi a tout konpatriyòt ki sikile l sou rezo sosyal yo, kòm pati refleksyon, seksyon nou «Edike Ayisyen Ayiti, e Ayisyen nan dyaspora». N ap remèsye tou Claudel Pierre-Louis, ki, pafwa fè nou jwenn kèk imaj Ayiti pou ilistre tèks nou yo. Remèsiman pou Jean Heber Bellefleur ki ede sikile online (sou nèt la) anpil nan refleksyon nou yo. Chile: Haitians in Chile (according to Miami Herald) : Ayisyen ki Chili (selon Miami Herald). Haitian Diaspora : Dyaspora Ayisyen. Post-dechoukay (after February 7, 1986 : apre 7 fevriye 1986). Sezon sechrès Ayiti (Season of drought in Haiti , Temporada di sekura na Haiti).